(from Venues Today, November 12, 2013) AEG and MGM have recently released the first plans for a $350-million venue in the middle of Las Vegas. The arena, which seats 20,000, is said to include several features that have never been seen before. Populous, the architects of the project, gained inspiration for the arena from the unique city surroundings. “It’s the high energy of The Strip up against the natural landscape around Las Vegas with the desert and mountains. We tried to find a way to blend the two,” said Lead Designer and Senior Principal at Populous Brad Clark. The entrance to the arena will feature a 12-story high glass facade with an LED overlay. “It’s maximum transparency. We’re still studying the technologies for this, but the video components that overlay the windows have a permeability to them, so when you’re outside the building at night, you’ll be able to see through the veil of LED,” stated Clark. 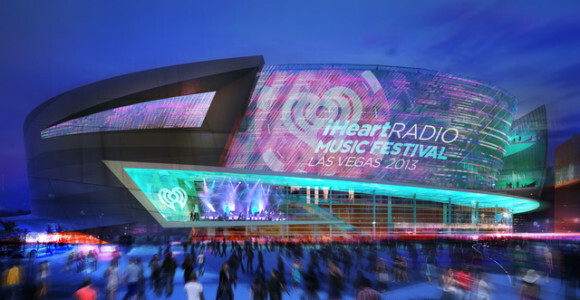 Plans for the arena include large balconies on the suite level that face toward The Strip so “People have the opportunity to be outside and take advantage of the see-and-be-seen type of environment,” said Clark. The side of the arena facing the highway will reflect a desert look. The plan is to host any and every Las Vegas event possible from concerts, mixed martial arts, boxing, awards shows, and any professional or college sports teams they can get. “We’re designing the building to accept an NBA or NHL tenant, or both. That was the mandate and we worked to those specifications. In the interim, it will be a heavy entertainment building,” stated Clark. The bowl and seating designs allow for maximum space and sound quality for concerts and adequate premium seating, suite and club offerings for sports events. “We’ve designed the arena for maximum flexibility. So whether it lands a pro team or not, we expect the building to land among the very best in the industry. When you see an event here, you’ll know right away it’s Las Vegas,” exclaimed Clark. The arena is on track to break ground in the spring of 2014 and open in 2016.